GReads! : My Top Ten Books I am Dying to Read! My Top Ten Books I am Dying to Read! 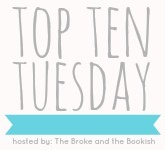 This week's Top 10 Tuesday prompt is a freebie, so I thought I'd list the books that I'm dying to read! Some of these are so far off in the distance they don't even have covers yet & the authors may still be writing them. Regardless, I am dying to read them when all of that is finished up!! Are any of these on your tbr list?! 17-year-old Gwen Castle's Biggest Mistake Ever, Cassidy Somers, is slumming it as a yard boy on her Nantucket-esque island this summer. He's a rich kid from across the bridge in Stony Bay, and she hails from a family of fishermen and housecleaners who keep the island's summer people happy. Gwen worries a life of cleaning houses will be her fate too, but just when it looks like she'll never escape her past—or the island—Gwen's dad gives her a tip: her wealthy, elderly employer is redoing her will this summer, and that could be Gwen's ticket to the good life. But what will it mean for Gwen’s now life? When aspiring music journalist Ren Kingston takes a job nannying for a wealthy family on the exclusive island of Nantucket, playground for Boston's elite, she's hoping for a low-key summer reading books and blogging about bands. Boys are firmly off the agenda. Two teens meet when they get stuck together in an elevator during a blackout. Afterward, they go their separate ways: one goes to the U.K. and one ends up moving to the West Coast. Los Angeles, 2012. It’s been five years since the events of the Mortal Instruments when Nephilim stood poised on the brink of oblivion and Shadowhunter Emma Carstairs lost her parents. After the blood and violence she witnessed as a child, Emma has dedicated her life to the eradication of demons and being the best, fastest and deadliest Shadowhunter since Jace Lightwood. Raised in the Los Angeles Institute, Emma is paired as a parabatai with her best friend, Julian. As Emma hunts those who caused the death of her parents, the trail they’re following leads back to those they’ve always been taught to trust. At the same time, Emma is falling in love with Julian — her closest friend and, because he is her parabatai, the one person in the world she’s absolutely forbidden by Shadowhunter Law to love. Arcadia “Cadie” Wells has one primary goal in life––to escape the sleepy Florida town where she was born and raised. Since her mother's death, she's sacrificed her boyfriend, her spot on the soccer team, and even her plans for the future to raise her little brother and help her still-grieving father. OMG, I'm DYING to read Allegiant too! How will I survive almost half a year?! I've never heard of the rest of the books, but they sound great. Ooh, good choices! Haven't heard of many of these but they sound awesome! So many great books to look forward to! I'm especially excited about Allegiant (though I still need to read Insurgent), Isla, and Emmy & Oliver. Great list! Always enjoy your lists - they make mine even bigger! I love your list. I'm especially dying for Allegiant, To All The Boys I've Loved Before, and Lola!!! Isla is a definite on my must read right now list! I have heard so many good things about the Divergent books, but I haven't read them yet sadly. Great picks! My TTT. I was excited about 70% of these before and now I've added the other 30% to my TBR list. I wish we didn't have to wait so long for most of them. Great list and idea!